Arrive in Rupit, situated at an altitude of 840m on top of a rocky promontory, around which runs the Rupit stream. A delightful place, Rupit preserves its medieval ambience with cobbled streets, and a jumble of stone and slate-roofed houses. Free day in Rupit: Optional circular walk around medieval Rupit, visiting the Sallent waterfall and Sant Joan de Fàbregues, one of the best examples of Catalan Romanesque architecture in the area (4.3 miles, 2 hours). Rupit to Mas La Serra via La Salut: From Rupit, pass the Salt de Sallent, follow paths along the edge of the Collsacabra with splendid views, then walk through open grassy pastures and woodland to the superbly situated Santuari de Nostra Senyora de la Salut, before continuing on to accommodation in a spectacular setting (7.6 or 10.5 miles, 3.5 or 5.5 hours). Mas la Serra to Joanetes: Enter the heart of the Collsacabra, a high isolated plateau with views across the whole of the Garrotxa. After visiting the hermitage of Sant Miquel de Castelló perched on a rocky outcrop, descend into the valley below to spend the night (5.8 miles, 3 hours). Or, a more challenging route with magnificent views takes you via the delightful village of Hostalets d’en Bas (7.7 miles, 4 hours). Joanetes to Santa Pau: Easy paths enter the Natural Park of Garrotxa passing Romanesque churches in picturesque woodland settings. Continue through beech forest between dormant volcanoes before reaching the medieval village of Santa Pau, an ancient barony with a castle founded in the 11th century (11.8 miles, 6 hours standard; 15.2 miles, 8 hours superior). Optional excursion to the dormant volcano of Santa Margarida, with its tiny chapel inside the crater, then back along a fertile valley to Santa Pau (7.8 miles, 4 hours). Alternatively, explore the excellent museums in Olot. 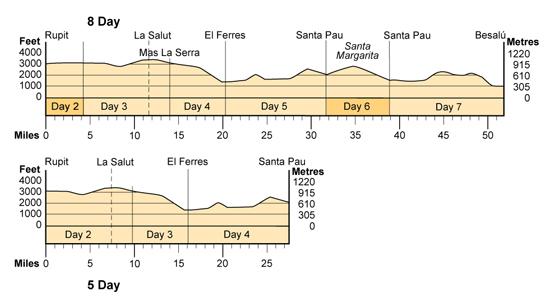 Santa Pau to Besalu: Footpaths pass craggy peaks and mountain rivers (opportunities for swimming in natural pools), before climbing to a high ridge with views. Then oak and pine forests lead to the medieval town of Besalú with its 11th century fortified bridge, Jewish bath-house and 12th century monastery church (12.6 miles, 6.5 hours standard; 9.8 miles, 5 hours superior). Departure day. If you would like to extend in Barcelona we are pleased to book a hotel for you. Our Hills of Girona route is mostly gentle, well-defined tracks across serra and through farmland; forest tracks and country lanes. Flowers and luxuriant vegetation in early summer. The fitness level for this trip is Grade 3. Cuina Volcànica describes the regional dishes that use local ingredients – e.g., beans, potatoes, grains and vegetables –grown in the area's nutrient-rich volcanic soil. Fesols de Santa Pau (Santa Pau kidney beans) feature heavily on menus, as do wild boar, lamb, rabbit, bolets (mushrooms) and various cured meats. Botifarra (sausage) with white beans is a Catalan favourite. Delicious, light, fresh white wines from the Penedés region, and more robust table wine from Emporda. Impressed with itinerary, and amazing scenery. Dramatic views and quiet valleys. Exceptional villages and warm welcome. Really enjoyed being in rural areas and seeing very few cars, even on paved roads. Gorgeous scenery, gracious people, great food. Beautiful scenery – lovely lunch stops en route. Overall the best itinerary we have been on. very changeable weather, some rain. 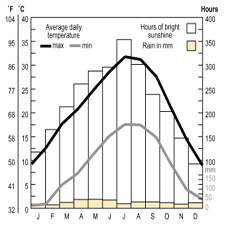 Summer (mid- June to mid-September) can be very hot. 8-day itinerary: Walks are offered on 6 days. 5-day itinerary: Walks are offered on 3 days. The walk lengths vary from from 2 hours to a maximum of 7 hours walking. Hours of walking, which may vary from individual to individual, means hours of actual walking and does not include stops for lunch, sightseeing, rests or siestas. On certain days the paths cross may more rugged terrain – please make sure that your foot-wear provides sufficient ankle support. plateau with spectacular rock formations – which you walk across, to the hermitage of Sant Miquel de Castelló perched on the edge of a cliff. You then descend on small woodland tracks into the fertile Vall de Bas, to follow paths through the volcanic zone within the Natural Park of the Garrotxa. From Santa Pau you follow well-marked routes past natural waterfalls and pools up into the mountains again, before descending to the historic town of Besalú. 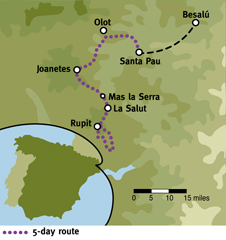 The recommended destination airports for this route are Barcelona or Girona. Either take the Aerobus from outside the airport (just outside the exit) which takes you to Sants Estació station (leaves every 15 mins and costs €6). Or take the train to Sants Estació from the RENFE station (leaves twice an hour and takes 12 mins, €4-5). From Sants Estació you want to take the train to Vic (pronounced BEEK, or write it down). If you have purchased a through ticket and encounter any difficulties at the ticket machine in Sants station simply go around the corner and show the ticket to the ticket man who will allow you through. Please note that you cannot purchase a ticket from Barcelona to Vic earlier than 2 hours prior to your journey and it is simplest to purchase this from the machine. If needed, there are left luggage lockers at Sants Estació station, Passeig de Gracia train station and at 58 La Rambla (information office). Trains continue to Ripoll, Ribes de Freser, Puigcerdà and Tour de Querol (in France) and one of these will be the destination on the departures board. You need to join the queue for Regionales trains. The journey to Vic takes 1.5 hours, costs €7-8. Trains from Barcelona to Vic depart regularly until 22.30 (from Barcelona Sants, 5 mins later from Barcelona Plaça Catalunya). Please check times locally, either at the Renfe counter in the station or at the Tourist Information in the airport prior to your journey. The train to Vic passes through Plaza Catalunya in the centre of Barcelona. If you are planning on staying in the city before the start of your Footloose holiday you may find it easier to take the train from Plaza Catalunya to Vic rather than making your way to Sants station. Or take the Aerobus to Plaza Catalunya. From Vic Station you can take a taxi direct to your hotel in Rupit or a bus, see details below. To get to Calle Casp from Plaza Catalunya, go up Passeig de Gracia, take first R along Calle (Carrer in Catalan) de Casp. After crossing over the first street, which is Carrer Pau Claris, the bus stop is on the RHS. The buses are at the bus stop 10-15 mins before departure. Please tell the driver you are going to Rupit. Price €10. There are regular airport buses to Girona bus and train station (next to each other). The journey takes 20 mins. Buses from Girona city to Vic take 1 hour (€.7.60). Please see TEISA bus timetablesand click on EIX bus. Please note there are many more departures from Girona central bus station than Girona airport, therefore most likely you are better off first taking an airport bus to Girona station. From Vic Station you can take a taxi direct to Rupit which will cost approx €55. If you would like us to arrange a taxi from Vic station to the hotel in Rupit please ring the office and order one before your departure. We recommend you do this if you are travelling on a Sunday, as taxis are hard to find. There is also a bus from Vic to Rupit. Check timetables at www.sagales.com . If you arrive at Vic by train the bus station at Vic is easy to reach – turn left out of the train station and it is 200m up the road. The bus leaves from stand no 1. Price approx. €4. If you are travelling to Rupit by bus or train and there is a wait for the connecting bus service to Vic, you may wish to explore the old part of Vic with its main square and old streets. It is within close walking distance of the bus and train stations (although there are no left-luggage facilities) and details can be obtained in advance by visiting Vic Tourism's Website. When you arrive in Rupit the bus will leave you outside the main town in a large car park. Follow the main road into town until you come to the main square with Hostal Estrella on your right hand side. Rupit is tiny and there is only one main street running through it. We can book you a taxi to the first hotel. The taxi holds 3-4 passengers (depending on luggage), and costs approx €160 from Barcelona airport or €115 from Girona airport. The Estrella hotel in Rupit can arrange parking in a garage for €10 per day (please book with the office). Alternatively there is large, free car park at the entrance to the village. Catalunya boasts an excellent and varied cuisine, which owes as much to its history as to the influence of the many cultures that have passed through its lands. The Greeks and the Romans brought with them many new crops and being a coastal region, fish is enthusiastically eaten. imaginative variations on previous traditions and has an exciting ‘new’ cuisine. In the Garrotxa they have developed a Cuina Volcànica (Volcanic cuisine!) which is a cuisine that has been born from the regional dishes and uses locally grown ingredients and traditional recipes. Santa Pau kidney beans (Fesols de Santa Pau) are found on many menus and other specialities include wild boar, lamb, rabbit, cured meats and wild mushrooms (bolets). Bottifarra (sausage) with white beans is a Catalunyan favourite! Most of the hotels we use offer a buffet-style breakfast with a wide range of both hot and cold choices. 4- and 5-star hotels almost always offer ‘cooked’ breakfast. Occasionally, in more remote areas, or in some 2 or 3-star hotels, breakfast can be a decidedly more ‘contenental’ affair – i.e. bread, croissant, juice, coffee. There are many Catalan wines of note, in particular those of the Penedès region to the south. Alella is one of the smallest wine-producing areas in Spain just north of Barcelona off the coast road, and it produces fresh and fruity white wines, which are sold under the label of ‘Alella Legítima’. Vi rosat – rosé, is often drunk very chilled with richer fish dishes. Another region close to the Garrotxa is the Emporda. Table wines come from Espolla and the bottled and more sophisticated red wines come from Perelada. There is no need to dress up for restaurants in this area, unless you plan to extend your trip in Barcelona and treat yourself to a special restaurant. The recommended airports for this trip are Barcelona and Girona. From Barcelona there are trains (€8) or buses to Vic (1.5 hours), then a local bus to Rupit, although we recommend booking a taxi from Vic to the first hotel. From Girona there are buses to Vic (1 hour). Taxi prices: Barcelona-first hotel €160; Girona airport-first hotel €115; Vic train station-first hotel €55. Prices may be significantly higher on Sundays and public holidays. Taxis can be booked via the ATG office. For more detailed 'getting there' information see Frequently Asked Questions below.